The new and upcoming Samsung Galaxy Note 3 has been all over the internet and a very hot topic these days in the mobile world. Recently, there has been image leak over the internet along with the specs for the Galaxy Samsung Note 3 which confirmed many specifications including the display and the screen size that were previously just speculated or were expected that the Galaxy Note 3 might hold. Since majority of the specs are now confirmed so let’s recap a little bit of what will the new Note carry with it. According to the images, Samsung Galaxy Note 3 has a 5.7-inch display. Previously we heard that the size would range from 5.7 inches to 6.3 inches but apparently the new size that the Samsung decided was 5.7 inches. Apparently, Samsung changed the plan after the market response from Galaxy Mega series according to some critics. We have seen that people didn’t like much about the Mega series especially with its extra huge display screen. The screen is likely to have a 1080p resolution but it is still not confirmed. The device will have 3 GB of RAM. This is one of the biggest things that we have seen so far in the Galaxy Note 3. The 3 GB RAM is enough for any sort of application and considering that it is just a smartphone, many of today’s computers actually run on that much RAM. The sources also confirmed that the phone will have the latest Android version which is Android 4.3 Jelly Beans. Previously, we had news that it will have Android 4.2 but now it is confirmed. The design, look and feel of the mobile is said to be similar to that of Galaxy S4 but it will hold the formal Note series style and design as well. 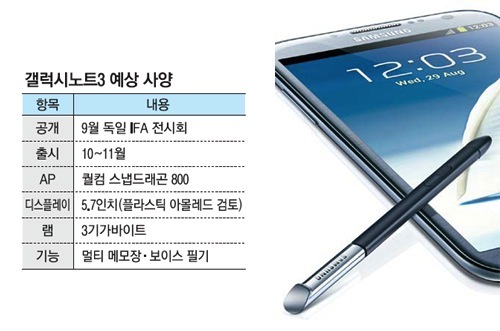 Samsung is planning to unveil their new Galaxy Note device at the September 4 event scheduled to hold in Berlin. Keep checking back as we will be posting updates about the new Galaxy Note 3 as soon as we get our hands on something interesting for you.